Mouse monoclonal Actin antibody [AC-40]. Validated in WB, ELISA, IHC, Dot, ICC/IF and tested in Mouse, Rat, Sheep, Rabbit, Goat, Chicken, Guinea pig, Hamster, Cow, Dog, Human, Pig and more. Synthetic peptide within Human Actin aa 365-375 (C terminal). The exact sequence is proprietary. Monoclonal anti-Actin recognizes an epitope located on the C-terminal end of actin. This epitope is conserved in all actin isoforms. Our Abpromise guarantee covers the use of ab11003 in the following tested applications. WB Use at an assay dependent concentration. Predicted molecular weight: 42 kDa. 1/500 using cultured Human or chicken fibroblast extract. Predicted molecular weight: 42 kDa. 1/200 determined by indirect immunofluorescent staining of cultured Human or chicken fibroblasts. ab11003 staining Actin in Human SW480 cells by Immunocytochemistry/ Immunofluorescence. The cells were formaldehyde fixed and then blocked using 10% serum for 1 hour at 25°C. Samples were then incubated with primary antibody at 1/50 for 2 hours at 25°C. 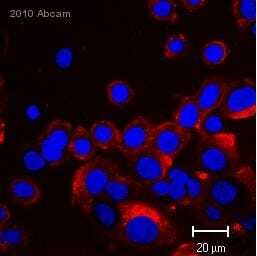 The secondary antibody used was a goat anti-mouse IgG conjugated to Alexa Fluor® 568 (red) used at a 1/100 dilution. Immunohistochemical analysis of frozen Human tongue tissue, using ab11003. ab11003 staining Human fibroblast cells by ELISA (Sandwich-capture). Cells were blocked in 1% BSA for 1 hour at 25°C. 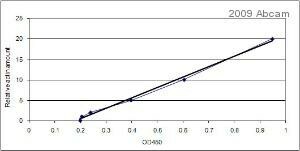 The primary antibody ab11003 (Capture antibody) was diluted 1/3000 and incubated with sample for 12 hours at 4°C. ab5694 was used as secondary and a HRP conjugated goat polyclonal to mouse, diluted 1/1000 was used as detection antibody. Publishing research using ab11003? Please let us know so that we can cite the reference in this datasheet. I have a problem with the antibody ab6276. I try to develop an indirect ELISA with this antibody, but do not get any result. This is the procedure, I've performed: - Coating of ELISA plate (Costar high bind) with actin (rabbit skeletal muscle, Cytoskeleton, inc. # AKL95)in carbonate/ bicarbonate buffer pH 9.6. Concentration range: 0.625 - 10 µg/mL), coating for 1h at room temperature or over night at 4 ˚C - Blocking: 5 % milk in PBST, 1h at room temperature - Detection antibody (ab6276): dilution in blocking buffer (see above), incubation for 1 h at room temp, dilution: 1:500 - 1:4000 - Secondary antibody (goat anti-mouse IgG HRP, santa cruz biotechnology, # sc-2005), dilution in blocking buffer (see above), incubation for 1 h at room temp, dilution: 1:2000 - 1:8000 - Detection with TMB substrate. No color development, also not after 2 hours. Between all steps, the plate was washed 3x with TBST (200 µL wash buffer/ well) In order to find the problem, I did the following tests: Antigen adsorption study with BCA assay. Antigen did adsorb on surface with a concentration of about 1 µg/mL. Adsorption of secondary antibody on plate, detection with secondary antibody: positive, ABs react with each other. Test of secondary AB with substrate: positive. Increasing the secondary antibody concentration to 1:1000, color development was detected, but the negative control (no antigen) showed the same intensity like the samples. 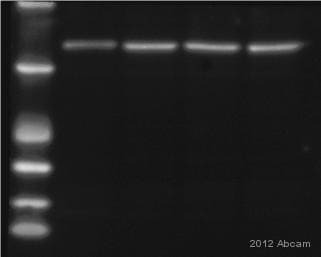 SDS PAGE/ Western blot with actin from the same source: positive. Do you have any suggestions? My thought is, that the protein is maybe folded in a way, that the antibody can't bind to the epitope since it is able to bind to the denatured protein in the western blot. I would not recommend adding SDS or a reducing agent to the sample prior to coating, as this may interfere with the coating efficiency. It is possible that by boiling the protein for 5-10 minutes, the heat denaturation may be enough to expose the epitope that is being recognized by this antibody in WB. This antibody is designed for detection of beta actin, not skeletal muscle actin. The homology between rabbit skeletal muscle actin (http://www.uniprot.org/uniprot/P68135)and the immunogen for this antibody is only 64%. Using an antibody directed against a more conserved region of actin, such as ab11003, may give better results. 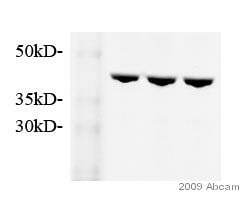 This antibody shows 100% homology with the above mentioned rabbit sequence. Could you please advise the lot & expiry for the new lot of ab11003? The new lot of ab11003 is currently in transit from the production lab to our stock and there is no lot number allocated yet, but I can confirm that this new lot is different from the lot your customer has received originally. I will send you the lot number as soon as it is created. We do not have set expiration dates for our products.Aliquotted, not diluted and stored at -20ºC, antibodies, includingab11003is stable for up to 5 years. Up to 10 years when stored at -80ºC. It is very importantto avoid repeated freeze / thaw cycles.We guarantee all of our products to work for at least 120 days from the date of purchase when stored correctly.For more information on antibody storage and stability, please visit our Antibody Storage Guide :https://www.abcam.com/index.html?pageconfig=resource&rid=10795 . Our customer would like to take back the same item, AB11003. However, they would like to have a another lot other thanGR2058. Please revert if this is acceptable. Unfortunately we do not have any other lot of ab11003 in stock. What steps have you altered to try and optimize the use of this antibody? I changed lysis buffer and added in c57 mice and HEK cell for comparison. Actin antibody was the last thing I thought could be wrong until it was verified by other colleagues. Thank you for filling in the questionnaire and for reporting this problem to us. We will use the details you sent about your protocol in order to investigate the source of the problem. I look forward to hearing from you with details of how you andyour customerwould like to proceed. One of our customer purchased the above item and had faced difficulties with working on the anti body. I have attached pictures, displaying the results of the experiment. I am sorry to hear your customeris experiencing difficulties with one of our products. We take product complaints very seriously, and investigate every product that we feel may not be performing correctly. Our end user want to use loading control. but a8226 data sheet describe that " Does not cross-react with adult cardiac, smooth, or skeletal muscle actin. " The sample of end user is myoblast, so they wonder they can use this antibody. And another antibody ab 8224 is not describe like ab8226. And then they wonder they can use ab11003 alpha actin. Could you recommend best loading control for myoblast sample? I wait your reply. Thank you for your enquiry. Ab8226 does not cross-react with ADULT cardiac, smooth, or skeletal muscle actin. Myoblasts are immature muscle cells and looking through the literature it does seem that some people use actin as a loading control. Your customer may want to try a tubulin loading control. However, I do not want to recommend a product that is unsuitable and suggest that you refer to the latest literature in this field.